Originally the head-wrap, or turban, was worn by both enslaved men and women. In time, however, it became almost exclusively a female accessory. In the photograph above, the women wear head-wraps, while the men wear hats. For their white European masters, the slaves' head-wraps were signs of poverty and subordination. Accounts of clothing distribution show that masters sometimes allotted extra handkerchiefs to their female slaves, ostensibly to be used as head coverings. In fact, in certain areas of the South, legislation appeared that required black women to wear their hair bound up in this manner. 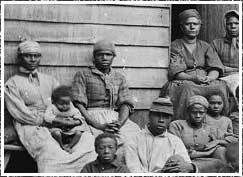 The head-wrap, however, was more than a badge of enslavement imposed on female slaves by their owners. Embellishment of the head and hair was a central component of dress in various parts of Africa, particularly in West Africa. From the time European fabrics were made available to them, African women wore head-wraps similar to those worn by their enslaved counterparts in America. For these women, the wrap, which varied in form from region to region, signified communal identity. At the same time, the particular appearance of an individual head-wrap was an expression of personal identity. In America, the head-wrap was a utilitarian item, which kept the slave's hair protected from the elements in which she worked and helped to curb the spread of lice. Yet, as in Africa, the head-wrap also created community -- as an item shared by female slaves -- and individuality, as a thing unique to the wearer. Cassandra Stancil, enslaved in her youth, insisted that she never asked another woman how to tie her head-scarf. "I always figured I could do it," she said, "I could try and experiment and if not get that, get something that I liked." The head-wrap was an object of oppression from one vantage point. 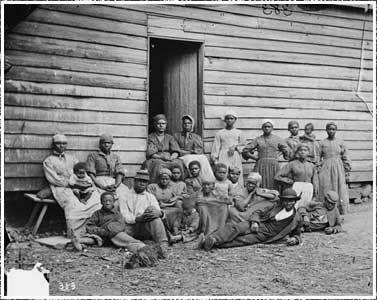 But from the other, the perspective of the slave community, it was a vehicle of empowerment and a memento of freedom.